This video was brought to my attention by a post on May 11th on MyParea.com. 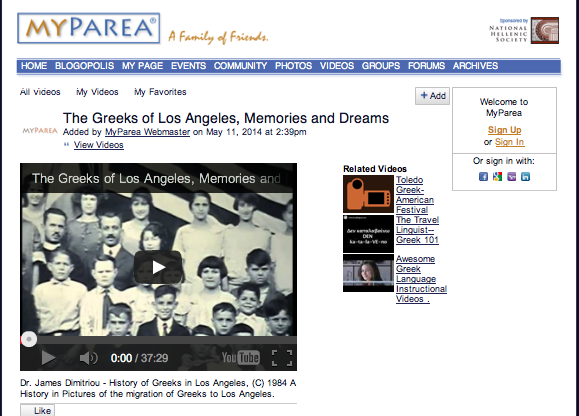 THE GREEKS OF LOS ANGELES, MEMORIES AND DREAMS is the most thorough Greek-American documentary I've seen to-date. Dr. James Dimitriou - History of Greeks in Los Angeles - A History in Pictures from up to 1984 of the migration of Greeks to Los Angeles. A dedication to the early Pioneers who endured great hardships to follow a dream.